Summer Release- House Expansions, Colorizer, Outfits and More! Poptropicans- we heard you, so we delivered! 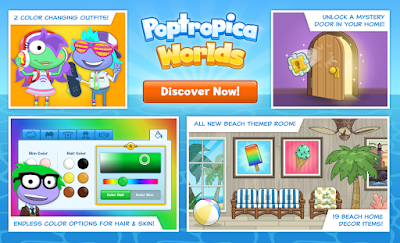 There’s been a #NewPopDrop in Poptropica Worlds and IT IS BIG! Some of the most requested features by you- the Avatar Colorizer AND color-changing outfits are now available in Poptropica Worlds! Explore islands in style with your fully customized Poptropican. Finally, the long awaited, FIRST EVER, House Expansion. This exotic new beach-themed room also unlocks 19 beach décor items for you to use and decorate your Home. Keep reading below to check out some of these awesome room additions. Is summer your favorite season? Well we also put out 8 summer- themed outfits so you can make sure your style is in season. A Beach themed House expansion! Now you never have to “really” leave the sunny shores of Home Island. First, find the key that unlocks this new room by going to the Décor Shop and selecting the farthest right tab with a key symbol on it. Once you gain access to this oasis of a room, it also gives you access to 19 new beach-themed décor items. Look for the decorations marked by the blue banner and key symbol in the store. Hot Off the Shelves: So far, some of the most popular items are the pineapple wallpaper, potted palm trees, the hammock, exotic ceiling fan, and the porch beach chair. Although personally, I am stocking up on beach balls. I am also OBSESSED with the beach window looking at Palm Trees. The view’s so clear I think can almost see 24 Carrot Island from here! Poptropican Colorizer— Thanks to the expansive new Colorizer, your Poptropican can now rock any vibrant color you could hope for! Head straight to your Closet and just tap the new, rightmost tab with the paint-bucket symbol. From here you can change your skin and hair color at any time to anything! Now your Poptropican can truly be customized just as you want them to be! The Colorizer allows you to truly have endless options! Pro Tip: Heads up, if you do select a new color, you will not be able to return to the original one, if it is not supplied in the basic color scheme you have available to you. 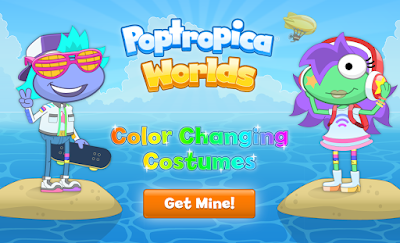 Color Changing Outfits— Speaking of crazy colors, don’t miss the sleek and dazzling new threads in the Poptropica Worlds Clothing Store. Head to there today to check out these eye-catching outfits. First off, how cool is it that these outfits change color? Really are a must have. Second, regardless of your Poptropican gender, Pop Worlds allows you to buy either outfit! 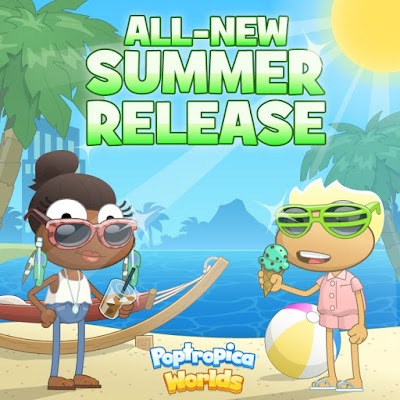 New Avatar Store Releases— Discover 8 ALL-NEW summer-themed clothes for your Poptropican! Whether you want to have some fun in the sun, enjoy a picnic or show off your style, there’s something for everyone! My Poptropican was first in line to try on these fabulous new pieces, and I’m loving them all! My first summer stop was the beach, and I grabbed some new pink shades, an ice cream cone and a sunhat to get outside to catch some rays! And of course my summer look wouldn’t be complete without a pair of gladiator sandals! Try mixing and matching different pieces to give your Poptropican a unique flare. Happy Friday, Poptropicans! 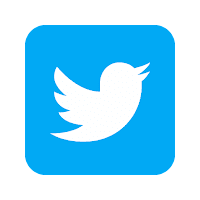 It’s time for another Friday Feature Favorite! One of my favorite things about the Pop Worlds Home Store-the cactus. Having a live plant gives my bedroom such a comfortable atmosphere, and matches wonderfully with the rest of my decorations. I wanted to model the theme of my bedroom around my cactus, so I chose blue wallpaper to match the vibrant green color, a desert painting and a rustic lamp to tie the look together. What are your favorite items on the Poptropica Worlds Store? Tag us on social media with your personalized homes, and head over to Poptropica Worlds now to start decorating! Have you had the chance to take on the latest adventure and save the citizens of 24 Carrot Island? Full of brand new scenes, mysterious disappearances and puzzling riddles, this version is remastered and even more thrilling than the original! Dr. Hare is back, and he is more powerful than ever! Should you choose to accept this dangerous quest, your mission is to stop this evil mastermind from destroying the carrot crops and hypnotizing the people of 24 Carrot Island! 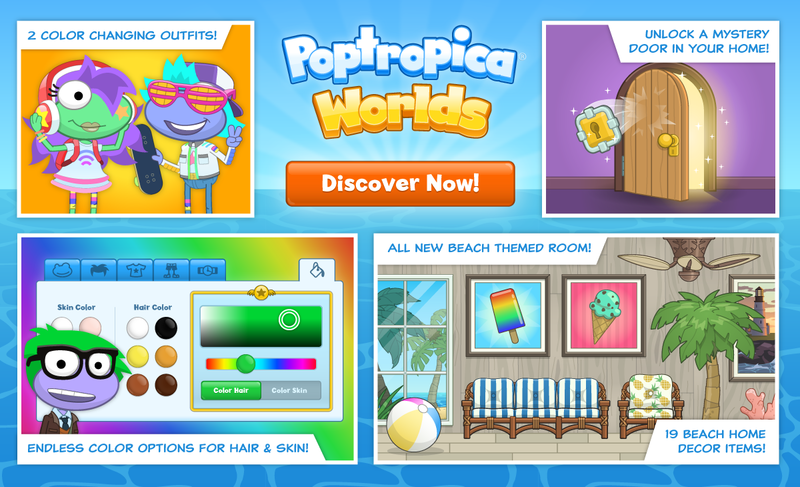 What are your favorite new features on the #PopWorlds version of 24 Carrot Island? My favorite is the end scene when you have to take down Dr. Hare’s robot- it’s WAY more challenging to take down this fighting machine! Tag us with what you love most about 24 Carrot Island and start playing today! How’s everyone’s summer going Poptropicans? Hope it’s been filled with adventures, not just the kind in Poptropica Worlds, but the ones found through summer reading! Hey there, Poptropicans! In honor of Shark Week, we wanted to highlight one of our favorite Poptropica Original Islands: Shark Tooth! Celebrate Shark Week by diving into the depths of this mysterious island. Your mission, should you choose to accept it, is to save your fellow Poptropicans from the HUGE shark lurking in Booga Bay, and make it safe to enjoy their tropical paradise again! Along the way, pick up the ingredients you need to calm the shark once and for all. While you’re conquering this quest, don’t forget to pick up the ultimate shark gear at the Shark Fins stand! And while you’re at it, stop by the Shark Museum to learn some pretty cool facts! Did you know that there are more than 340 known species of sharks?